Our tea selection at Highland Coffees includes fine black teas, oolongs, green teas, white teas, and herbal teas from the world’s historic tea producing countries. We bring in teas from the classic tea growing regions of India, China, Sri Lanka, Japan, and Taiwan. Our teas capture the distinct and subtle flavors created by the unique combinations of soil, rainfall, elevation, cultivation, harvesting, and processing of each region. As with our coffees, we look for teas produced using sustainable growing practices. All true teas come from the Camellia Sinensis plant, known as the tea plant, which is native to eastern and southern Asia. Sinensis means “Chinese” in Latin. Camellia Japonica and Camellia Sasanqua, two of the most popular cousins of the tea plant, are beloved across Louisiana and the Southeastern U.S. for their beautiful flowers. Different types of tea (black, green, white, and oolong) are the result of differences in how the leaves are processed. The following sections provide further information about these differences in processing as well as the variety of teas prepared and sold at Highland Coffees. 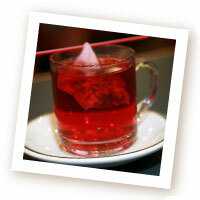 For our specific tea offerings, view our Tea Profile Chart. We also offer these Tea Tips to provide you with maximum tea drinking enjoyment. To create black tea, the leaves are first taken through the stages of withering (wilting) and rolling (breaking). The tea leaves are then fermented, or oxidized, as released enzymes combine with other chemical components of the leaves and oxygen. The amount of oxidation that is allowed to occur helps shape the flavor, strength, body, and color of the tea. The tea leaves turn from green to copper-red to brown and eventually to brownish-black when fired (dried) to stop oxidation. Black teas yield a brew that ranges in color from light amber to dark reddish-brown, and they have flavors that can be from light and flowery to strong and pleasantly pungent. In green tea production, freshly plucked tea leaves are withered and immediately steamed (heated) or pan fired to kill the enzymes so that no fermentation (oxidation) occurs. The tea leaves are then rolled, shaped, and steamed or fired, until nearly all of the moisture evaporates. Green teas produce a soft golden green to bright green brew and a light, fresh, sometimes grassy flavor. The tea leaves for white tea are picked before the leaves fully open. The buds (unopened tea leaves) still show a white downy fuzz. The tea leaves are withered, carefully hand-selected, and then bake-dried. White tea has a light and very smooth taste. Considered a marriage between green and black teas, oolong tea is semi-fermented. After withering, the tea leaves are basket-tossed to bruise the edges of the leaves and initiate oxidation. Partial oxidation, between fifteen and seventy-five percent, is allowed to take place. The leaves are then fired to kill the enzymes and stop fermentation. The tea is rolled to give the leaves the desired shape and then fired again. 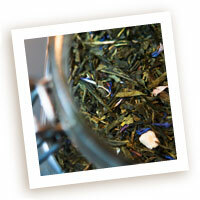 With oolong teas the flavor in the cup tends to be smooth and delicate with subtle fruit and floral notes. Not actually from the tea plant, herbal teas, or tisanes, are infusions of dried flowers, leaves, berries, herbs, and spices and do not require elaborate processing. They are generally caffeine-free and often produce calming and soothing effects.